Alert: “The Microsoft Exchange Information Store service terminated with service-specific error 0 (0×0)”.The error seems to simple and everyone would just suggest to start the service back. But the root cause was different. One of our colleague started working on the alert and here is the chronology of steps followed in resolving the issue. found that the Information Store service was in stopped state and started the service. 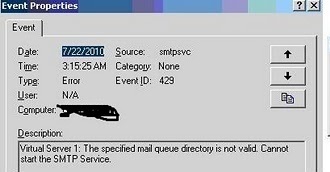 Started verifying queues , encountered error stating that “Default SMTP Virtual Server is unavailable”. Verified and found that SMTP Service was in started mode. Escalated call to me and I’ve started working on the issue. Upon further analysis, found that the SMTP Virtual Instance was stopped in ESM (Exchange System Manager). Tried to start the instance, encountered error stating that “Queue Directory is corrupted , hence the instance could not be started”. Error logged in Event log & Error pop-up when accessed Queue Directory from explorer. 2. Executed chkdsk on volume in which the exchange database is stored. Found disk errors. 4. Created new Queue Directory and pointed the path from ESM to the new folder. 5. Started SMTP Virtual Instance & Information Store Services. This entry was posted in Exchange and tagged Exchange 2003 Queue Directory Corrupt, hence the instance could not be started, mailroot\vsi1\queue is corrupt, mailroot\vsi1\queue is not accessible, Queue Directory is corrupted, The Microsoft Exchange Information Store service terminated with service-specific error 0 (0×0). Bookmark the permalink.